The best cost efficient tent solution for your tent and table event. Pole Tents are the traditional pole tents, most commonly known as Circus tent. 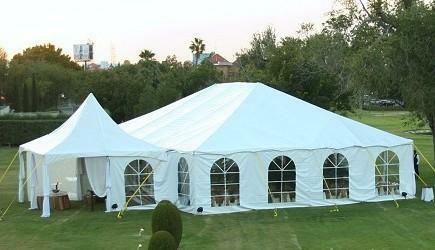 This tent style has been used from centuries back from early Persian times to nowadays. This Tent principle was used to create all the new tents available. This type of tent contains center poles and it can only be install on dirt or ground that allows staking. Tents are the perfect solution for an outdoor event with the assurance that Central Texas Weather will not interfere with your plans. In Austin and the Hill Country is very difficult to predict how the weather will be that special day. Whether is summer or winter Texas Party Rental tent and table will make your event a great success. Frame structure tents are structured with no center poles. Tents are the perfect solution for an outdoor event with the assurance that Central Texas Weather will not interfere in your plans. In Austin and the Hill Country is very difficult to predict how the weather will be that Special day. Rain or shine, hot or cold, summer or winter, Texas Party Rental tents will make your event a great success. Another advantage of frame tents is that they can be installed one beside of the other creating bigger covered areas that can be also separated areas or rooms for storage, catering service, bartending and entrance. The tent is built by rigid framework which allows a freestanding quality frame. Our Frame tents are made of steel and aluminum parts which transform in a very secure and reliable structure. We have white tops that block-out the sun light and clear plastic tops. This is the most recommendable tent for any Special Event. Text: Tent walls are available to enclose the event. The tent perimeter is partially closed, leaving openings that help guest flow. Side Walls can help block side rain drops and are good to keep room temperature even on all the tent space, a perfect solution to keep the heat created inside, keeping the tent warm during a cold Texan winter. Texas Party Rental walls come in vinyl fabric and different sizes are available, depending on your needs. This item also helps break low-mild wind. Very strong wind can make walls flap around. Text: Clear tent walls help enclose the perimeter but allows you to enjoy the outside view. This type of wall allows sunlight to pass through. Enjoy a magical starry night or a romantic full moon view. Side walls can help block side raindrops and are good to keep room temperature even on all the tent space, a perfect solution to keep the heater warmth inside the tent in a cold Texan winter. Texas Party Rental walls come in vinyl fabric and multiple sizes available depending on your needs. This item also helps break low-mild wind. Very strong wind can make walls flap around. Text: This side wall is a hybrid combination of the white and clear wall. Elegance meets functional ! The aesthetic purpose of this type of wall is to enhance the inner view of the party while giving a superb image from the outside and leaving spots to enjoy the outside view. Side walls can help block side rain drops and are good to keep room temperature even on all the tent space, a perfect solution to keep the heater warmth inside the tent in a cold Texan winter. Texas Party Rental walls come in vinyl fabric and multiple sizes available depending on your needs. This item also helps break low-mild wind. Very strong wind can make walls flap around. Text: Tent side summer walls are made from cotton cloth which allows air flow and shade down the sun light at the same time. This item is pretty much a Texas Party Rental exclusive. Created on the Mexican-Texan desert this item allow airflow to cool down the severe Texas summer temperatures while shading the heat sunlight irradiates. The summer side walls are not waterproof. These cotton fabric walls come in different sizes depending on the event needs. This item also helps break low-mild wind but if the wind is too strong it can make walls flap around. Text: Water Barrels is the solution when stacking to the ground is not possible. Texas Party Rental uses 55 gallon water barrels to secure the tents. We anchor the tent to the water barrels in order to secure it; this method is not intended for a long period of time or for difficult weather conditions. Text : Leg wrapping is a standard in all of our tents. In Texas Party Rental we are normally raising the bar in quality, aesthetics, customer satisfaction and much more. Leg wrapping covers the poles of the structure tents with elegant fabric giving a smooth look and feel. Our standard accessories are the other’s luxury. Text: Leg wrapping is a decoration technique to enhance tent design and overall looks that would set the atmosphere of your party/event. Leg wrapping is available in different colors. In Texas Party Rental we are normally raising the bar in quality, aesthetics, customer satisfaction and much more. Leg wrapping covers the poles of the structure tents with beautiful fabric, that gives a smooth look and feel. Text: Tent fluorescent lighting is available for our tents and. This eco-friendly product provides good quality lighting with energy saver and low power consumption, all of this with no heat waves from the lamps. Texas Party Rental installs the lights while installing the tent, this to procure that cords are not visible. Lighting is very important for the success of the event, functional and decorative that creates that perfect event environment. Text: Par Can Lighting is a string of bulbs attached to each other. Do you remember how carnivals use to light their tents? This is a line method were one bulb follows the other one string and so on. Texas Party Rental installs the lights while installing the tent, this to procure that cords are not visible for our customer’s guest. Lighting is very important for the success of the event, functional and decorative that creates that perfect event environment. Text: Twinkle light is available for our tents as a way to decorate. This decoration’s primary purpose not intended to serve as a lighting source for the party. Twinkle light is perfect for dark a nightly event that needs a spark of decoration to maximize guest experience Texas Party Rental installs the lights while installing the tent, this to procure that cords are not visible. Lighting is very important for the success of the event, functional and decorative that creates that perfect environment. Text: Chandelier lighting is an item that combines a good source of light with a touch of sophistication. Chandelier provides both functionality and elegance, that enhance your event’s ambiance. Ask for our decoration packages that will help expand that special event experience. Texas Party Rental installs the lights while installing the tent, this to procure that cords are not visible to guests. Very important for the success of the event, functional and decorative that creates that perfect event environment. Text: A double ceiling is the ultimate luxury expression. Tent liners are wrapped around to cover tent inside vinyl roof, and it is made of a soft wavy fabric draped all over. This design is for customers that want s to host a top of the line event by creating a fabulous elegant look. Text: Barrel covers are fabric that covers the barrels that anchor the tent, providing a better look. Text : Tent Guttering is attached to the structure that way water is diverted down to each side of the tent. Perfect for a rainy weather.